In March 2014, the Del Mar Fairgrounds removed the three tall light poles from their paved parking lot. Osprey had built nests on two of those poles. The Fairgrounds installed two osprey nesting platforms near the San Dieguito Lagoon Boardwalk and their south overflow lot wetlands restoration project and transferred the nesting material from the poles to the platforms, and the osprey moved right in to the eastern platform! Trail users watched the nest closely with their binoculars or the built-in scope at the boardwalk viewing platform. In May, two chicks hatched. 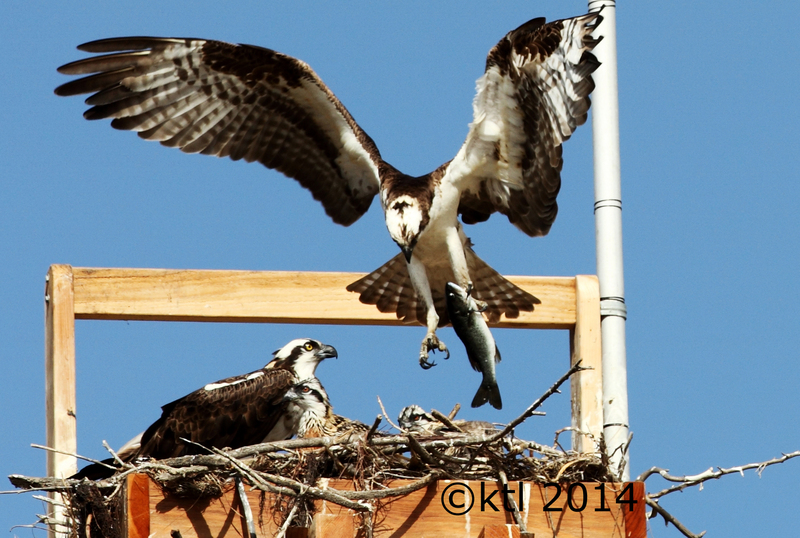 In 2015, a pair of ospreys built a new nest on the western platform, and two chicks hatched. To accommodate Phase II of the south overflow lot wetlands restoration project, the nesting platforms were relocated to near the driving range by the Del Mar Fairgrounds in January 2016. A pair of ospreys built a new nest on top of the old nest on the western platform, making it hard to see how many chicks had hatched until about three weeks after we started seeing the mother osprey feeding them because it was so deep. Turned out we had two chicks hatch again. In 2017, a pair of ospreys (it is really hard to tell if it is the same pair each year) added to the western nest, making it even bigger. Three chicks hatched! To see the osprey nests for yourself, park at the San Dieguito Lagoon Staging Area off of San Andres Dr. and take the Coast to Crest Trail west about 1 mile to the other side of the freeway. The two platforms are located on wooden poles between the trail and the driving range.